An enchanting 1860’s Civil War era gold silk evening bodice. 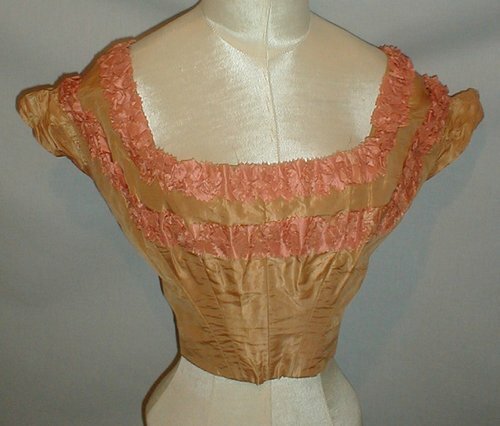 The bodice is decorated with bands of pleated pink silk. It has short puffed sleeves. The neck, armscyes and waist are piped. The bodice is lined with cotton and has a back lacing closure. The original lacing is missing. The bodice is in very good condition. There are no splits or holes. There is underarm discoloration mostly under one arm. Bust 34 Waist 23. I love the look of the pink silk against the gold.